I also finished a hat for my hubby. I used a free pattern called “Turn A Square” from one of my favorite designers, Jared Flood. I used Noro yarn for the first time and liked it better than I thought I would. I really love the colors, but it’s not very soft to work with, so I wasn’t sure how it was going to feel close the the skin. It’s actually ok… certainly not the softest hat, but not itchy or rough like had feared. You can clearly see the square pattern in the top. Such a neat and clean closure. 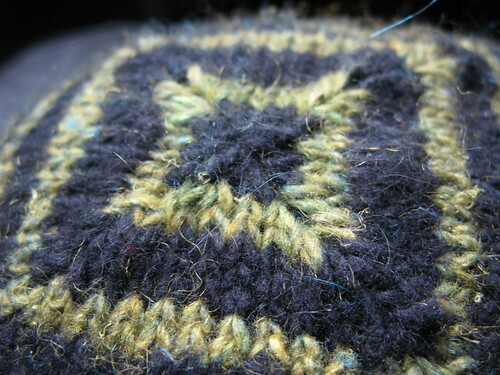 Jared’s knitting is impeccable, if you have a minute, do check out his flickr images if you want to be inspired. I’m signed up for his sweater class in March. Here’s his touring schedule. I’m so thrilled to learn from him!! 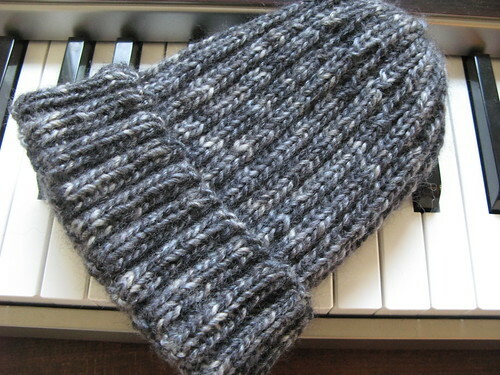 And last but not least, I cranked out a ribbed hat for my dad with a free pattern called “Just a Beanie“. I used Cascade Yarns Lana Bambu. 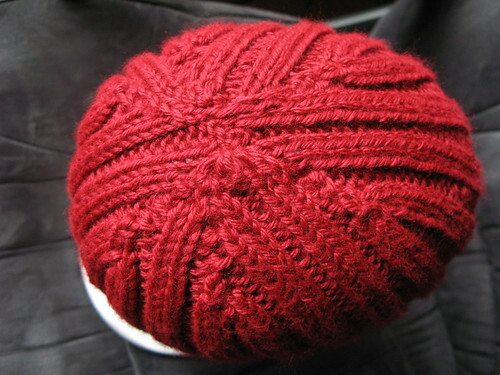 The yearn is super soft, I really enjoyed working with it. I was worried that it wouldn’t have enough spring in it for the ribbed pattern, but it turned out really nice. The cool thing about this pattern is that the flipped up ribs match the ribs on your head. The only thing I didn’t like was how visible the decreases at the top (not that my own attempt turned out any better). 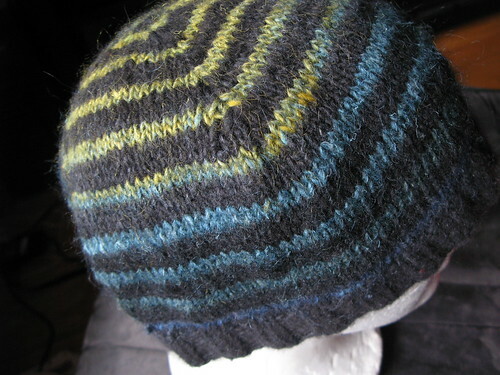 It just looked kind of sloppy, but since it was a speckled yarn, it wasn’t very noticable – especially to a nonknitter. 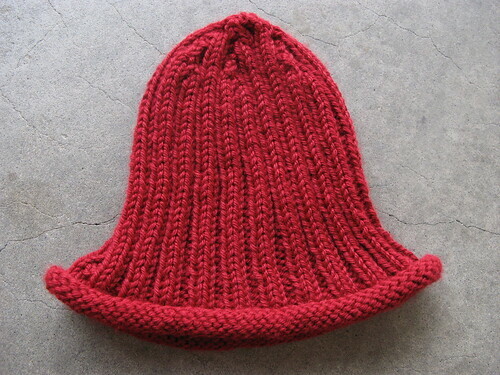 I need to do some research though, because I really want to find out good decrease method for a ribbed hat. 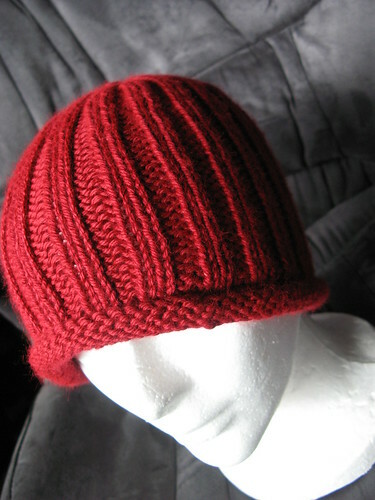 What’s your favorite ribbed hat pattern?